Riser Config 1, 1 x 16 FH, Customer KitThe Riser from Dell™ fits into the PCI-E slot of your Dell System. Riser cards are used to extend a slot for a chip or card in a fully loaded computer. This product has been tested and validated for on Dell systems to ensure it will work with your computer. It is supported by Dell Technical Support when used with a Dell system. 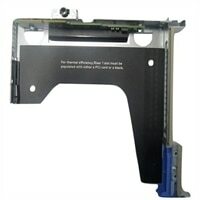 The Riser from Dell™ fits into the PCI-E slot of your Dell System. Riser cards are used to extend a slot for a chip or card in a fully loaded computer. This product has been tested and validated for on Dell systems to ensure it will work with your computer. It is supported by Dell Technical Support when used with a Dell system.